IU vs Iowa, at the Memorial Stadium, near Bloomington, IN. Photo by Wayne Carter. 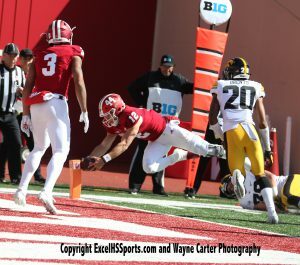 On a crisp October afternoon in Bloomington, the Indiana Hoosiers got off to a strong start, as they ate up over four minutes of time and Logan Justus, McCordsville junior kicked a 29 yard field goal putting the Hoosiers up 3-0. 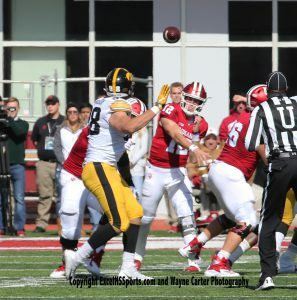 Iowa would then take over the pigskin and consume just three minutes and twelve seconds as they found the end zone when Nate Stanley, 6’4, Junior quarterback connected with T J Hockenson for a nine yard reception. Hockenson is a 6’5 Junior from Chairton, Iowa. 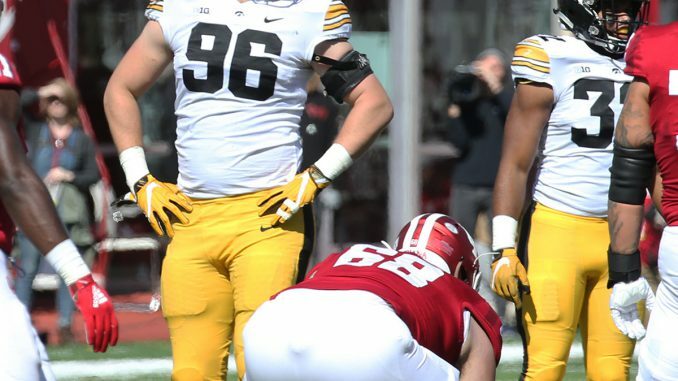 Indiana would draw two unsportsmanlike penalties on the bench and Iowa once again would take the ball and score on a four minute drive as Stanely hit Iowa, Junior Noah Fant with a 28 yard strike putting Iowa up 14-3 at the end of the first quarter. 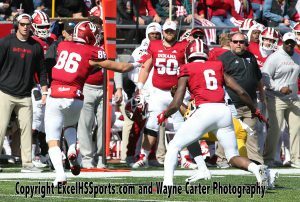 Indiana would strike back with a quick explosion on a two play drive that finished with Peyton Ramsey, 6’2, 200 pound sophomore found Ty Fryfogle with a 33 yard yard connection to draw the Hoosiers within four at 14 to 10. Ramsey hails from Cincinnati, Ohio (Elder High School) while Fryfogle hails from Mississippi. 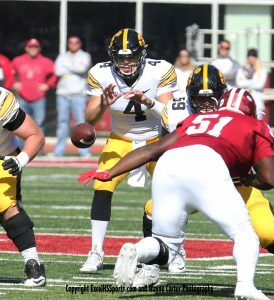 This score would not stop Iowa as they again scored in quick fashion as Stanley hit Newton, Iowa Senior Nick Easley on a 12 yard strike to put the Hawkeyes back up 21-10. Indiana would drive the field but this is where things kind of came unhinged for the Hoosiers. Ramsey threw a strike to 6′ Senior Luke Timian. Timian made a valiant effort to secure the ball but the officials ruled incomplete. Indiana Head Coach Tom Allen would challenge the play and lose the challenge eliminating Indiana from a challenge for the rest of the game. Allen then was flagged for a unsportsmanlike penalty and Iowa would run out the half up by 11. The second half saw Iowa came out with purpose and score twice more in the third quarter, a Stanley to back up running back Toren Young, a Madison, Wisconin sophomore filling in for fellow sophomore Ivory Kelly-Martin strike of 11 yards and a 54 yard connection to T J Hockenson running out the score to 35-10. Indiana would score once more time as Ramsey scored from 12 yards out to close the gap to 35-16. 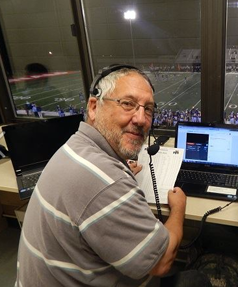 Stanley would find the end zone once more time when he hit Austin Kelly with a four yard pass to make the final score 42-16. 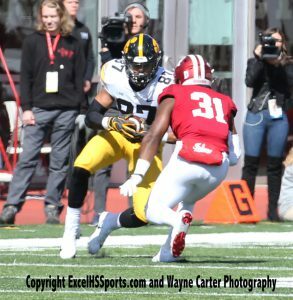 Iowa was led on the ground by Toren Young with 96 backed up by Mekhi Sargent with 64. Stanley was 21/33/1 for 320 yards while the receiving crew was led by Hockenson’s 107 yards and Fant with his 101 yards on four catches. Indiana was led by Ramsey’s 31/42/2 for 263 yards with Reese Taylor’s six receptions for 28 yards, Donovan Hale’s 51 yards and Luke Timian’s 35 yards. Stevie Scott rushed for 30 yards. Iowa moves to 5-1 with a game upcoming with Maryland while Indiana welcomes Penn State, who will be coming off a loss to Michigan State.